I've never read a Jodi Picoult book before, but I will be reading more after this. Despite Katie's burying her head in the sand, which is sometimes hard to believe, Plain Truth gives a wonderful respectful insight into the Amish way of life. Katie Fisher is a young Amish girl living the plain life in Paradise, Pennsylvania. She is courting Samuel, attending church and helping her parents on their farm. One night she wakes up with stomach cramps and goes into her father's barn where she delivers a baby boy. Exhausted, she falls asleep holding the baby and praying to God to help her. She wakes a few hours later and God has answered her prayers - the baby has disappeared. Katie goes back to the house to sleep then when the boys come to do the milking, the dead body of the baby is found. Katie's "Englischer" cousin, Ellie, is a lawyer and volunteers to defend Katie when he is charged with murder of the baby. Katie first denies that she was ever pregnant but, as she comes to trust Ellie, the story unfolds whilst Katie awaits trial. 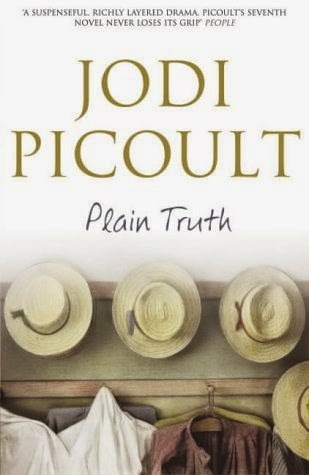 Jodi Picoult effortlessly slips from simple farm life to courtroom drama and I read this book in a few days. I didn't really know much about the Amish community so I enjoyed learning about their way of life whilst this tragic story unfolded. page 81 - Furniture had been moved to make room for the the long, backless church benches, which arrived by wagon and could be transported from home to home. page 393 - As if listening to his own his words, he slowly got to his feet and stared at the jury.